InterMoor has acquired all intellectual property of the BEL Grapnel & Chaser (BEL) company, including drawings, designs, and cast patterns for its complete range of anchor and chain handling equipment (chasers and grapnels). These chasers are suitable for most types of anchors and are easily repaired. They have a cross section capable of supporting the load whilst still being small enough to cut through most soils when chasing. The material selected for BEL Chain Chasers combines the desired strength and corrosion resistance while ensuring that damage is not inflicted to the anchor chain. Single bolt withdrawal enables relatively quick assembly to or removal from the anchor chain. The Chaser body is manufactured from the same material as BEL Chain Chasers but the Rocker on which the wire rope slides is made from an abrasion resistant alloy having a higher through-hardness. The Rocker is mounted on a through bolt of NI-Cr-Mo Alloy Steel with a Stainless Steel nut, which helps to prevent the nut seizing on. 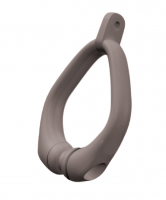 This arrangement provides a detachable feature for easy assembly to the mooring cable and Rocker replacement if necessary. This Chaser easily slides towards the anchor head shackle and then locks on the chain links close to the anchor head. The anchor is then subjected to vertical retrieval thus eliminating most of the chain forces towards the rig. These Chasers have a cross section capable of supporting the load whilst still being small enough to cut through most soils when chasing. The material selected combines the desired strength and corrosion resistance while ensuring that damage is not inflicted to the anchor chain. 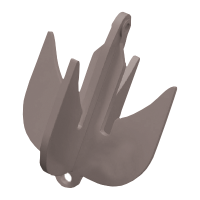 The Grapnel was designed initially as a “Fishing” tool primarily for the purpose of recovering an anchor and chain that has become detached and has fallen to the sea bed. A Shackle Eye is provided at each end of the Shank. The Head Eye is attached to the trawl cable and the Tail Eye may be attached to a trailing cable for the purpose of withdrawing the Grapnel in the event that the flukes engage with an “immovable” object on the sea bed.